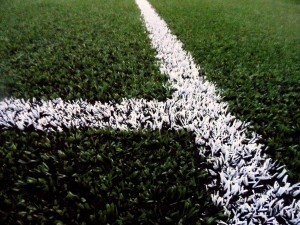 The introduction of 3G artificial grass pitches in the UK means it is now possible for professional football matches to be played on synthetic turf pitches as the new surfacing meets the standards of FIFA 1* and FIFA 2* accreditations. The third generation grass pitches are designed to give natural performance characteristics and improve ball bounce, as well as giving the sports facility a professional and clean look without the endless maintenance which comes with natural grass pitches. For more advice on maintaining synthetic sports pitches, please take a moment to complete our enquiry form so one of our experts can get back to you. We can give you an idea of costs for carrying out the work which may be required at your facility. Improving ball bounce capabilities – this gives the surface better performance characteristics and ensures that the sports pitch plays as well as natural grass and gives the players the best experience. Ensures proper drainage – It is vital that your artificial grass sports pitch has adequate drainage qualities so that water doesn’t build up on the surface. If the rubber infill becomes compacted, this can block the permeable membrane of the grass pitch and prevent water from draining through. Keep the pitch safe – If the rubber infill gets pushed down into the pitch surface and stops holding up the grass fibres, this can lead the grass to start lying flat and become slippery which would be unsafe for the players. Deep cleaning – Decompaction of sand and rubber infill to spread the particles out around the pitch, as well as removing and contaminated particles. Moss and algae treatment – Removing any contamination to ensure the the drainage system and overall quality of the surface is as good as possible. Drag brushing – Loosening any compacted sand and rubber crumb infill and spreading it through the grass fibres. Adjusting infill levels – Adding a top up of sand or rubber infill particles to ensure that the performance qualities of the pitch are the best they can be. We are a leading contractor in the maintenance of artificial sports surfaces and we can assist you with the cleaning and maintenance of any sports surface you have. We can carry out testing to help you determine what time of maintenance would be best for your facility, and then help you with keeping your sports surface in tip top condition! If you would like any further information about maintenance or construction of synthetic sports surfaces, please visit our website at https://www.sportsandsafetysurfaces.co.uk/. To discuss an enquiry for a maintenance job or a full construction project, please email scott@softsurfaces.co.uk and we will be able to help you with details of prices, quotes and specifications for your sports surfacing requirements.